Nothing screams “DJ” like a turntable. At its core, DJing is an art form. Music is the medium, our ears the canvas, and DJ equipment the brush DJs use to create their masterpieces. No other tool in a DJs arsenal is quite like the classic turntable when it comes to sound quality and cool factor. 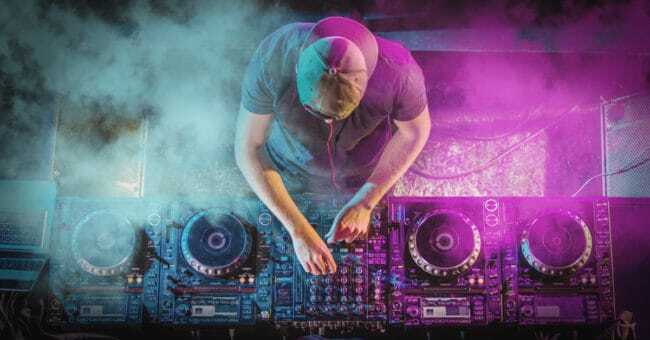 The tried and tested DJ setup of two turntables and a mixer not only looks cool, but it also exudes a pro-like aura often not found in all-in-one DJ controllers*. A staple since the 1970’s, turntables are the heart and soul of many of the world’s top DJ rigs. If you’re building a modular setup from scratch and are looking for the best turntables for DJing, read on. We’re going to review the best DJ turntables for beginners and pros alike in this comprehensive review. *Don’t get us wrong, we love DJ controllers and think they are the future of DJing. But first, a few words on turntables. Before we go any further, let’s talk about what a DJ turntable is and how it works. If you’re a beginner, you may want to check this section out first. If you know your stuff, you can skip this and head on to the review section of this article. Hey, you want to jump to the meat of things? No problem! Here’s an overview of the DJ turntables we’ll be reviewing. Click on the link skip this section. What is a DJ Turntable? 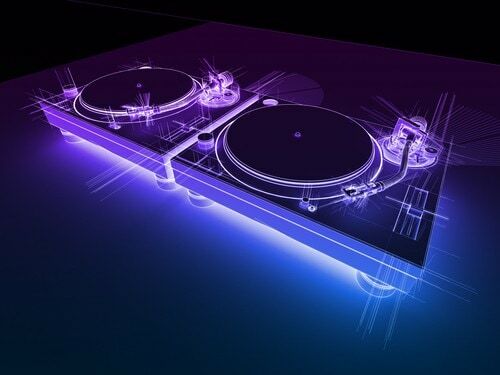 DJs (disc jockeys) use a digital or audiophile (analog) turntable to manage prerecorded music for events and parties. Most of these devices nowadays are CD players equipped with a slip-pad disc, more like a platter on a traditional turntable. Others have remained true to form, sporting a setup that only accepts vinyl records. But this isn’t a Discman or your grandfather’s gramophone. Not to be mistaken for regular CD players or regular vinyl record players, DJ turntables have plenty of other functions designed for DJing. These include flash memory storage for tracks, automatic looping and cue point marking, to name a few. These types of turntables are also more durable compared to home audio equipment. Renowned oldskool DJ Grand Wizzard Theodore is widely credited as the man who invented the scratching technique. To make a “scratch” sound, you have to hold and reverse the slip-pad. DJ turntables can also produce and simulate a variety of special effects. 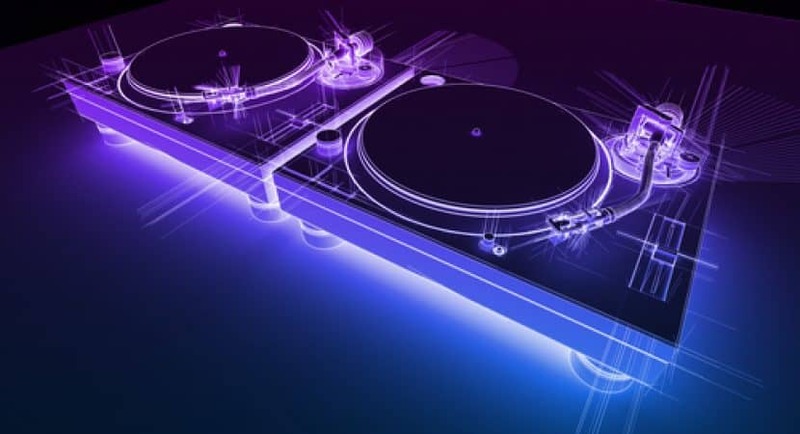 Needle drops and platter manipulation created many of the sound effects still used today and gave life to the term “turntablism.” The DJ scene exploded in popularity at the same time CDs burst into the scene. This led manufacturers to make an effects-infused digital turntable, emulating the spinning platter. There isn’t a battle between these turntable types per se, as both can be fantastic additions to any DJ setup. Both analog and digital turntables have loyal fans, with both camps harping about the advantages of each one. We’ll get to these later. First, let’s talk about what makes each turntable different. Turntables are synonymous to vinyl and the art of DJing. The entire industry started with a vinyl record and a turntable, so the association is natural. Many DJs still use vinyl, especially when performing live. Vinyl enthusiasts will tell you that there’s no sound like the sound that comes out of a vinyl record, and they’re right. Analog DJ turntables are all about control. DJs have complete control over the music when they go analog. They can perform complex scratching techniques and sound effects. Most traditional turntables use belt-drives, which absorbs shock and prevents vibrations. For fantastic and accurate playback, nothing compares to a turntable that uses a belt-drive to spin the deck. Some use direct drives (like CDJ turntables), which tend to last longer when used for scratching. DJ turntables are sturdier than regular turntables to endure the rigors of DJing. CD turntables are basically turntables that play CDs instead of vinyl. 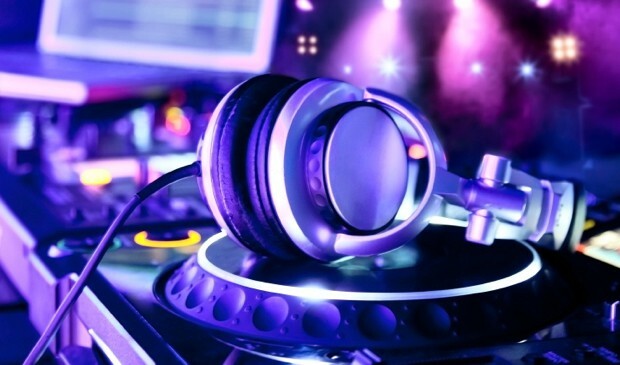 DJs can perform sound manipulation and make various sound effects like scratching a record on a turntable. Digital technology also allows you to skip, track time, sample a sound and program cue points. These advantages give DJs surgical control over the music and open new avenues not found in analog turntables. CDJs also have inputs that allow DJs to play music from USBs and other media. A short discussion about DJ turntables and why it’s an essential part of any setup. Now that the intro is over let’s get down to brass tacks. Are you ready? The best DJ turntables review starts now. The art of DJing requires turntables. There’s no substitute for it. The passion, precision, and timing needed to perform using turntables are what the art of DJing is all about. Anyone can save a playlist, pop it in a DJ controller and play like a pro. But if you want to command the respect of your peers, you need a good DJ turntable. If you’re a beginner DJ looking to level-up your skills, a turntable should be a part of your setup. In this review, the Pyle PLTTB1 Pro Turntable will be the focus of our attention. We’ll let you in on any secrets and tell you why you should put this turntable in your list. If you’re in the market for an affordable, no-nonsense DJ turntable, the Pyle PLTTB1 Pro is worth a look. This entry-level turntable is excellent if you’re just starting out as a DJ and would like to learn the intricacies of using vinyl. It’s also a pretty reliable partner for your vinyl collection if you’re a new audiophile without a hi-fi setup. The Pyle PLTTB1 has more than enough features to keep you happy. Dual playback speeds at 33 ⅓, and 45 rpm guarantees you can play any 7″ or 12″ record from your collection. The turntable also has adjustable pitch control, giving you total control over vintage vinyl records. The sound quality is good considering the turntables’ price point. Yes, from an all plastic turntable, the sound on this baby was surprisingly good. The decent sound quality is due in large part to the belt-drive that powers the platter. The Pyle’s weighted “S” tonearm complements the belt-drive well, and the anti-skate function means no more arm skating. The Pyle PLTTB1 Manual Turntable has a strobe light that illuminates the outer-edge markings. The lighting system makes it easy to speed adjust on the fly. => Click here to check the prices! We down with the Pyle PLTTB1 and here’s what we found out. The Pyle PLTTB1 worked flawlessly, albeit with a few configuration adjustments before we partied with it. Following instructions on the manual, we had to balance the counterweight on the S tonearm for it to work correctly. You may experience some misalignment issues on the stylus and cartridge, but these can be fixed easily. Once we got it working though, we found that the sound was pretty amazing for the Pyle’s price. The belt-driven platter was quiet, and vibrations were kept to a minimum. The anti-skate function was a little iffy when we set it on high, so we left it at either 0 or 1, and the Pyle worked great. We liked the strobe lamp a lot, but it only seemed to work at 33RPM. We would need to do further tests on this to make sure we’re doing it right, so stay tuned. We also love the fact that the cartridge is upgradeable. There is no pre-amp and USB connection though. Look elsewhere if those features are important to you. Now, for the build quality. On the Pyle’s durability, well you can’t really expect too much because it’s made of plastic. Even the platter is plastic, so while hard plastics were used all around, a drop or two from a table is sure to damage this turntable. So be careful when handling it. The Pyle PLTTB1 doesn’t really have an auto-switching voltage selector per se. There’s a manual voltage selector below the platter that you have to check before plugging the device. You have to do this first, or risk frying your new turntable. Like all our other reviews, it’s spec-sheet time! We make it a point to take in all relevant information before we part with our hard earned cash, and you should too. It’s always prudent to know the details of a product you’re planning to buy, and DJ turntables are no exception. Here are all the essential specs and other useful stuff on the Pyle PLTTB1 Professional Belt-Drive Manual Turntable. If stats are not your thing, you can always scroll down to our verdict. The Pyle PLTTB1 Pro Belt-Drive Manual is an excellent entry-level turntable for beginner DJs and early vinyl collectors. The belt-driven motor on the platter is quiet, the shock absorbing pads work well, and the whole thing is relatively easy to configure. The weighted “S” tonearm works excellent, and the upgradeable cartridge sealed the deal for us. The Pyle PLTTB1 can be an excellent DJ turntable for mobile gigs because it’s compact and lightweight. Because of its plastic construction though, there could be some durability issues down the line if you play rough. Despite this, you’re getting a lot of turntable for this price. Treat this Pyle turntable right, and it will last you a long time. You’ve reached the point where you absolutely have to get your hands on a DJ turntable. If that’s the case, then the Audio-Technica AT-LP1240 is a turntable that’s worth a good look. Not only is it one of the best turntables for DJing, but it’s also pretty incredible for home use by vinyl enthusiasts. There’s plenty of things to like about the AT-LP1240 DJ turntable, which is why this device ranks high on our DJ gear list. The included RCA (w/ground) and power cables are all detachable. The switchable internal preamp is more than adequate for regular use and sounds good. But if you need more power, you can use an external amp. The anti-skate function worked well and had no issues. Although it doesn’t come with a cartridge, the AT-LP1240 is compatible with most cartridges. The USB output and the bundled Audacity software allows for high-quality digital transfers. The turntable can play three speeds, and the start/braking system is great for DJing. We also loved the S tonearm because of the excellent counterweight and adjustable height. The line output is only 150 mV, and we had the volume knob turned up a little higher. You would need an external amp when playing in a nightclub or party. Audio-Technica could have bundled the AT-LP1240 with better software, not beginner level Audacity. There’s also minimal instructions for setting up the cartridge correctly. You can find instructions online, but it’s a pain looking for them. You won’t find a better DJ turntable at this price point. The Audio-Technica AT-LP1240 has plenty of features for its price, and the built-in preamp sounds great, albeit a little weak. The lack of a cartridge isn’t a big deal, because you would want to upgrade anyway. If you’re serious about being a turntablist or you just want to enjoy your vinyl collection, you can’t go wrong with the AT-LP1240. The Stanton T52B Belt-Drive Turntable is a beautiful piece of gear for both beginner DJs and new audiophiles alike. Professional DJing features such as two Start/Stop buttons, and a pitch control slider gives you more control when performing. The straight tonearm works just as good as an “S” shaped one, and Stanton made this one skip resistant. There’s also a removable target light that illuminates the platter in dark situations. There is some assembly required, but it’s not a big deal if you follow the instruction manual. What other features make the T52B turntable so unique? Belt-drive turntables are retro and professional, and this makes the Stanton standout from the crowd. There’s one feature that we really liked: the tone adjustment slider. This particular slider changes the voice on the record to either a baritone or soprano, without changing the speed of the record. Stanton designed the TB52B Straight Arm Belt-Drive Turntable to be sturdy and easy to use. The layout is practical and comfortable to use even for extended periods. We like the straight tonearm, which makes the Stanton TB52B one of the best turntable for scratching. If you’re a new audiophile collecting her first vinyl record or a beginner DJ looking for his first DJ turntable, the Stanton T52B is good first buy. It’s a simple turntable that is surprisingly well built and pumps out excellent sound for its price point. In the market for a new, entry-level turntable for your vinyl music collection? The Audio-Technica AT-LP60 is an automatic belt-drive stereo turntable that’s great for home use. The turntable has an integrated switchable phono pre-amplifier. This makes it easy to connect the AT-LP60 directly to a computer, powered speakers, or a home stereo. Let’s take a closer look at the AT-LP60 Automatic Belt-Drive Turntable and what makes an excellent entry-level turntable. This silver Audio-Technica AT-LP60 Turntable is entirely automatic and has phono outputs at the turntable level. What we like about the turntable is the switchable built-in preamp. The preamp has line-level outputs for connecting to computers and other amplifiers. The AT-LP60 can play records at two speeds: 33-1/3 RPM and 45 RPM. It also comes with an Audio-Technica Dual Magnet™ phono cartridge with replaceable diamond stylus. Unfortunately, the cartridge itself isn’t replaceable. The good news is cartridges made by Audio-Technica are excellent. Using the AT-LP60 is a piece of cake. All you need to do is press the Start button, and the platter will start turning as the tonearm lifts itself up. The operation then positions the stylus over the record’s lead-in groove and lowers it gently. When the last track is played, the AT-LP60 lifts the tonearm automatically and returns it back to its armrest. The platter also shuts off after everything. This turntable can be used for DJing in theory, but it’s not suitable for scratching because of the belt-drive and auto tonearm. The Audio-Technica LP60 is easy to use and even easier to assemble, as long as you follow the manual and use common sense. For the price, you’re getting a pretty decent entry-level turntable that’s perfect for new audiophiles or those who want to get back to vinyl. If you already have a home theatre setup and want to complement it with a turntable, you can’t go wrong with the AT-LP60. If you’re looking for a direct drive turntable loaded with enough features to put a smile on your face, you’ve come to the right place. The silver LP120-USB from Audio-Technica is a beast of a turntable. It’s like buying a car fully-loaded with impressive features, you won’t need to hit the aftermarket for extra gear. What’s great about this turntable is the price, and you’re definitely getting your money’s worth. Let’s review the AT-LP120-USB Turntable and see why it should have a place in your setup. Making a foray into the wonderful world of vinyl? You’ll love the Audio-Technica LP120-USB turntable. The die-cast aluminum platter uses a direct-drive motor that’s also perfect for DJing. The stroboscopic platter light indicates the current speed of your record, which is useful for performances. The AT-LP120 is a fully manual turntable, giving you precise control over cueing. You can play tracks either forward or in reverse, and the built-in preamp is a fantastic addition. We love the USB output because you just hook it up to a computer to digitally rip your vinyl records. The Audio-Technica LP120-USB is a high-quality turntable in a surprisingly affordable package. It’s brimming with features often reserved for more expensive turntables. The USB port is a godsend as it lets you connect the AT-LP120-USB straight to your computer. The included software has its shortcomings, but the digital conversions we made were pretty accurate. If you’re looking for your first or next turntable, consider getting this one. The Gemini TT is an old-school, and new-tech turntable all rolled into one. USB connectivity, club or battle style placement, Audacity – these are just some of the great features the TT-1100USB has in store for you. If you’re a DJ or an audiophile and you want to know about this affordable and well-built turntable, read on! Buying the Gemini TT-1100USB Belt Drive DJ Turntable is (and should be) a no-brainer. While the TT’s platter uses a classic belt-drive motor, the turntable has plenty of tech for you to play with. It features a USB port for direct connections to a Mac or PC so you can effortlessly rip vinyl to digital. Gemini throws in Audacity software for this task, and it does a pretty accurate job. You can use the TT-1100USB for battle or club styles, depending on what you need it for. There’s plenty to like about the Gemini TT-1100USB turntable. The build quality is excellent, with a sturdy ABS base and enclosure paired with adjustable rubber feet. The rubber base and the belt-drive motor eliminates external vibration. The aluminum platter and tonearm play well together, offering precision tracking and control. If you want a feature-rich yet classic DJ turntable that won’t break the bank, consider getting the Gemini TT-1100USB. It’s suitable for both the home audiophile and mobile or club DJ needing a reliable turntable. The sampling rate to transfer vinyl to digital is 44.1 kHz with a 16-bit depth. This gives you a fantastic reproduction as long as your source record doesn’t have significant issues. 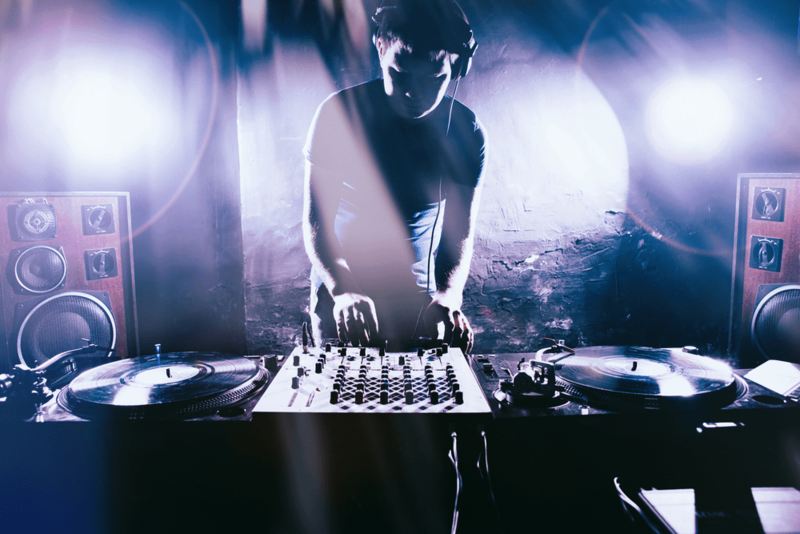 Are you getting serious with turntablism? If you’re ready to upgrade your old turntable, the Pioneer DJ PLX-500-K will hold your hand and lead you to nirvana at a fraction of the cost. The PLX-500-K turntable is a superb piece of disc jockeying gear that won’t break the bank. It’s the younger brother of Pioneer’s high-end, professional PLX-1000 and shares big bro’s looks. When it comes to features, PLX-500-k can hold its own against other turntables in the same price range. Lakes take a closer look. The Pioneer PLX-500-K benefits from shared design elements with the PLX-1000 turntable. These include amazing, high-quality analog playback and professional, good looks. Pioneer also designed and built the PLX-500-K for DJs and audiophiles in mind. The direct-drive motor is dependable, smooth and made for spinning, mixing and scratching. Out of the box, the PLX-500-K is good, but it won’t knock your socks off. To really get the most out of this turntable, you need to pony up for upgrades on the cartridge and stylus. The deck also feels a bit sluggish at times, but if you get used to it, it becomes effortless. In the looks department, the PLX-500-K looks like it’s older brother, so it looks like the legendary Technics 1210 by default, which is great. While it lacks some of the features found in the high-end turntable bracket, the PLX-500-K won’t leave you hanging. So, if you’re ready for an upgrade from beginner to mid-level turntable, consider the Pioneer PLX-500-K. It looks and perfmorms well, especailly after you upgrade some of it’s components. Turntables are unique and will always hold a special place in any DJ’s setup. These marvels of audio engineering bring excellent sound and an old-school charm not found in many of the newer DJ tech these days. When it comes to DJ turntables, what truly matters is the pure freedom and joy it gives us. Turntables allow DJs to be themselves and showcase real skills when they perform. 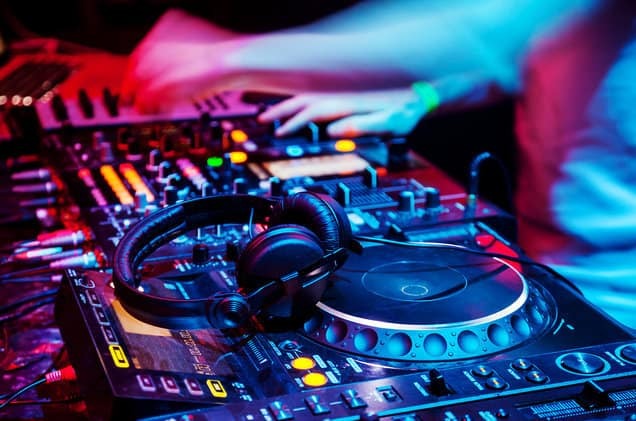 Whether it’s a scratch-heavy turntablist dishing out hip-hop or a new age DJ spinning and mixing, turntables are the focal point of their art. Even home audiophiles benefit a lot from the pure, unfiltered music coming out of a vinyl record. Listening to vinyl is like going back to the past, pulling up a chair and relaxing in the studio. There’s nothing else like it. When it comes to what type of turntable to choose, well there’s a sea of them out there. Use this review to guide you on making the right choice. 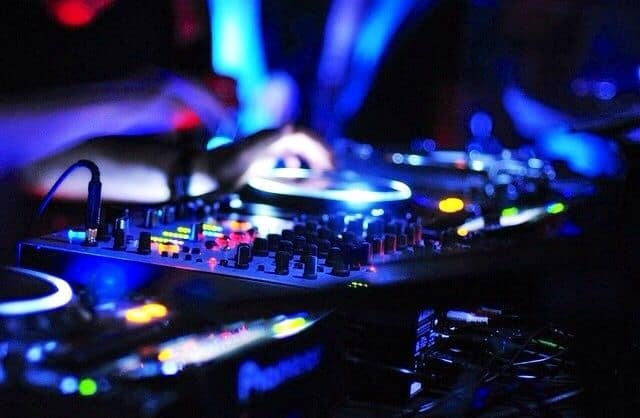 Both belt-drive and direct-drive turntables can be used for DJing, but how good they actually work will depend on your playstyle and what type of DJ you are. Belt-drive turntables use a motor that’s spun by a rubber belt that’s off the side. This minimizes noise and vibration coming from the motor, giving you better sound. This type of turntable won’t last long under heavy scratching. Regular mixing should be fine. Direct-drive turntables were built with DJs in mind. The motor is durable enough to withstand abuse from different kinds of scratching techniques. Direct-drive motors tend to be noisier than their belt-drive cousins. If you’re starting out on your vinyl journey, choose a turntable with a built-in preamp and USB connectivity. This will save you a lot of time and effort and you can digitize your vinyl collection. Always choose a good speaker and upgrade your cartridge if possible. Many people complain that the turntable they got didn’t produce good sound, but it’s often not the turntable’s fault. Heavy duty audio cables also help. This ends our turntable review. We hope you found the information here useful and our content entertaining. Thank you and until next time!